An infield ground ball deflected off an umpire, resulting in a double play during the Cubs-Dragons (A) game. Double deflection; ball remains live. With none out and one on (R1) in the top of the 5th inning, South Bend Cubs batter P.J. Higgins hit a ground ball back to the mound and off pitcher Alex Webb's back, deflecting into the legs of 1B Umpire Isaias Barba, working inside due to the runner on first, and caromed to shortstop Luis Gonzalez, who stepped on second base and threw to first baseman James Vasquez for the twin killing. 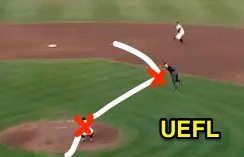 Replays indicate the ball indeed made contact with F1 Webb before striking U1 Barba, who himself displayed an abbreviated "safe" mechanic to indicate the ball was to remain live; HP Umpire Tom Hanahan, like Barba, likewise properly made no "Time" call, instead, keeping the play alive. Official Baseball Rule 5.06(c)(6) states that a batted ball becomes dead when, "A fair ball touches a runner or an umpire on fair territory before it touches an infielder including the pitcher, or touches an umpire before it has passed an infielder other than the pitcher; runners advance, if forced." In other words, because the ball first touched pitcher Webb, the first part of the sentence takes precedence and, accordingly, Rule 5.06(c)(6) does not apply, meaning the ball was not dead when it subsequently touched U1 Barba (NOTE: the grammatical structure of this rule incorrectly suggests that, logically, the two conditions are independent of each other when, in fact, the first criterion, if excluded by the failure of its own dependent clause [i.e., if "before it touches an infielder including the pitcher" is not satisfied], supersedes the second). Had the ball not touched pitcher Webb (and simply passed him) and instead first touched umpire Barba, all else equal, the second part of the sentence would indicate that the play should be ruled dead. OBR 5.06(c) also prescribes the outcome of a dead ball which results from 5.06(c)(6): "The ball becomes dead and runners advance one base, or return to their bases, without liability to be put out." In the aforementioned play, had the ball not touched F1 Webb and a dead ball resulted upon the first touch of U1 Barba, the proper call would have been to award the batter first base, which would have subsequently forced R1 to second base (if the only baserunner began the play on second [or third] base, however, [s]he would have been returned to second [or third] base, since there would be no forced reason to advance due to the batter becoming a runner and being awarded first base). For scoring purposes, the batter awarded first base would be credited with a single.